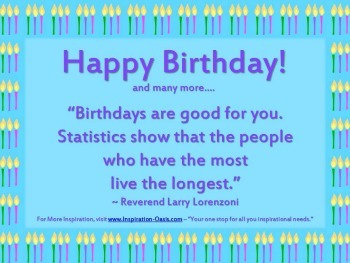 Searching for special inspirational birthday quotes for that special person? Look no further, you are sure to find the "just right" quote for the occasion. If you survive long enough, you're revered-rather like an old building. Once I was looking through the kitchen window at dusk and I saw an old woman looking in. Suddenly the light changed and I realized that the old woman was myself. you see, it all happens on the outside; inside one doesn't change. "If wrinkles must be written upon our brows, let them not be written upon the heart. The spirit should never grow old." yours gave to me a friend. Be sure to check out our GREAT 50th Birthday Party Ideas to throw that memorable landmark party.